TAAG Angola Airlines E.P. (Portuguese: TAAG Linhas Aéreas de Angola E.P.) is the state-owned national airline of Angola. Based in Luanda, the airline operates an all-Boeing fleet on domestic services within Angola, medium-haul services in Africa and long-haul services to Brazil, Cuba, China, and Portugal. The airline was originally set up by the government as DTA – Divisão dos Transportes Aéreos in 1938, rechristened TAAG Angola Airlines in 1973, and gained flag carrier status in 1975. It is now a member of both the International Air Transport Association and the African Airlines Association. The origins of the carrier can be traced back to 1937, when the president of Portugal Óscar Carmona commended Joaquim de Almedia Baltazar to create an airline in Angola. In September 1938, DTA – Divisão dos Transportes Aéreos was formed as a division of the Administration of Railways, Harbours, and Air Transport of Portuguese West Africa. It was owned and run by the government, which authorised the acquisition of three Dragons and two Junkers Ju 52s, although the latter two aircraft were not delivered due to the outbreak of the Second World War. Operations began on 17 July 1940, using De Havilland Dragon Rapide biplanes. The first routes to be operated were founded by the Aero Club of Angola and included two main lines: one running between Luanda and Pointe Noire, having connections with Aeromaritime services to Europe, and the other being Luanda–Benguela–Lobito that was later extended to Moçâmedes. Flights were intermittently discontinued during World War II due to the scarcity of spare parts, but by the end of the war the airline resumed operations. Two Stinson Reliants bought from the Belgian Congo in 1944 permitted the carrier to resume coastal services. The DC-3 and the Beech 18 joined the fleet in 1946. In March that year, a new route to Leopoldville was launched. The airline joined the International Air Transport Association in 1951. Also this year, the company extended the Leopoldville route far east, serving Lourenço Marques, but this destination was later abandoned due to poor financial performance. DTA also operated a route linking Luanda with Lourenço Marques via Livingstone between 1951 and 1952; poor occupation prompted the airline to terminate the service. A 700-mile (1,100 km) long route to São Tomé was launched in 1956. By April 1960 (1960-04), the fleet was composed of four Beech 18s, seven DC-3s and three DH.89s. A year later, DTA became the third African airline in ordering the Fokker F-27, with two aircraft acquired. At this time, the company had a route network that was 3,300 miles (5,300 km) long. The F-27s were incorporated into the fleet in 1962. Served with these brand new aircraft, Windhoek was added to the route network that year. A TAAG Angola Airlines Boeing 707-320C at Lisbon Portela Airport in 1991. Following renaming to TAAG – Transportes Aéreos de Angola on 1 October 1973, the airline was reorganised and reconstituted. The company's shareholders at the time were the Angolan government (51%), TAP Air Portugal (29%) and ex-DTA employees (20%). Four Boeing 737-200s were ordered in 1974. The same year, a new livery including the Palança Negra was unveiled. Three F-27s and six DC-3s comprised the fleet by March 1975 (1975-03). Following the rise to power of the communists, that year the country gained independence from Portugal; the airline became Angola's flag carrier in October. In November, the company took delivery of the first Boeing 737-200. In January 1976 (1976-01), the delivery of two Boeing 737-200Cs was blocked by the US State Department; the embargo was lifted two months later following the end of the civil war in the country. Valued at around US$18 million, these two aircraft were finally delivered by late April that year. In February the same year, an ex-Allegheny Airlines Fairchild FH-227 on delivery flight to Suidwes Lugdiens was forced to land at Luanda while flying over Angolan territory. The country seized control of the aircraft, which was later reported to be in service with TAAG, along with an ex-Argentine Air Force Caravelle and two ex-THY Turkish Airlines F-27s. Three Yak-40s entered the fleet in 1977, along with other Soviet-built aircraft; late this year, an ex-British Caledonian Airways Boeing 707-320C was sold to TAAG. In 1978, TAAG acquired two used F27s from Fokker, and another Boeing 737 was ordered a year later. A Lockheed L-100-20, registration D2-FAF, was involved in an accident while landing at São Tomé. A Portugal-registered Lockheed L-1011-500 wearing the TAAG Angola Airlines livery at Faro Airport in 1995. By March 1980 (1980-03), the carrier had a fleet of three Boeing 707-320Cs, three Boeing 737-200Cs, six Fokker F27s —four -600s and two -200s—, three L-100s —two -20s and one -30— and four Yakovlev Yak-40s to serve a number of domestic destinations, plus Brazzaville, São Tome, Lagos, Maputo, Lisbon, Moscow, Paris and Rome. The company was reorganised again during the year. On 8 June, a Yak-40 (registration D2-TYC) crashed near Matala killing all 19 occupants on board. On 16 May 1981, the crew of four on board a Lockheed L-100-20 Hercules, registration D2-EAS, lost their lives in an accident at Mongua. During the early 1980s the fleet also included a small number of Antonov An-26s that started being phased out. One of these examples (D2-TAB) was involved in an accident at Monte Bibala on 29 November 1982; 15 people lost their lives. Another fatal accident took place almost a year later, on 8 November 1983, when the crash of a Boeing 737-200 (D2-TBN) at Lubango resulted in 130 fatalities. Serious financial difficulties were uncovered during 1984. In the mid-1980s, an L-100 Hercules was withdrawn from service and two Ilyushin Il-62Ms were acquired for operations to Cuba. The carrier phased in the first of these two aircraft in 1988. On 21 July 1988, a Boeing 707 freighter owned by the airline crashed 20 kilometres (12 mi) away from Murtala Muhammed International Airport; six crewmembers lost their lives in the accident. A now-retired TAAG Angola Airlines Boeing 747-300M at Charles de Gaulle Airport in 2005. 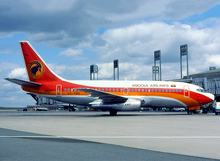 At March 1990 (1990-03), TAAG Angola Airlines had TAAG-Air Charter and TAAG Aviacao Ligeira as associated companies; the number of employees was 5,770. At this time, the fleet consisted of six Boeing 707-320s (one -320B and five -320Cs), four Boeing 737-200s, one Boeing 737-200C, one Lockheed L100-200, six Fokker F.27s (one -100, one -400M, one -500 and three -600s) and two Yakovlev Yak-40s. The carrier's network comprised 18 domestic points in Angola served from Luanda plus international flights to Berlin-Schonefeld, Brazaville, Havana, Kinshasa, Lisbon, Lusaka, Maputo, Moscow, Paris, Rio de Janeiro, Rome, Sal and Sao Tome. On 31 January 1995, a Boeing 727-200, registration D2-TJB, crashed on landing at Huambo; the landing gear was torn off following the aircraft aquaplaning off the pavement as a result of a long landing. There were no serious injuries among the occupants of the aircraft. TAAG bought a Boeing 747-300 Combi from Singapore Airlines in 1997. In July 2005 (2005-07), TAAG Angola Airlines informed that it firmed up an order for three Boeing 777-200ERs and four Boeing 737-700s, it also took options on one and two more of these aircraft, respectively. The firm-ordered aircraft were initially scheduled for delivery in July 2006 (2006-07). The new aircraft were aimed at replacing the ageing Boeing 747-300s and Boeing 737-200s. The order was partially fulfilled in November 2006, when two Boeing 777-200ERs and three 737-700s were delivered. One of these Boeing 777-200ERs established a record-breaking distance for the delivery of the type, when it flew 12,860 kilometres (6,940 nmi; 7,990 mi) between Seattle and Luanda in 16 hours and 47 minutes. On 29 April 2010, it was announced that TAAG had ordered two Boeing 777-300ERs, with an option for two more. In March 2011 (2011-03), the Boeing 747-300 fleet was retired from service. In June the same year, the airline received its first newly acquired Boeing 777-300ER, out of two ordered in October 2009; TAAG became the first African carrier in purchasing and operating this type of aircraft. Three additional 293-seater Boeing 777-300ERs were ordered in April 2012 (2012-04), in a deal worth US$895 million. The European Union (EU), in its fourth update of the list of blacklisted airlines released in July 2007 (2007-07), banned TAAG aircraft from entering into European airspace because of safety concerns. At the same time, the United Kingdom barred TAAG from flying into its territory, just before the airline was about to start services to London-Gatwick; in retaliation, Angola banned British Airways from landing within the country's borders. The carrier announced it was losing US$5 million a month owing to the ban. To continue operating flights to Europe, TAAG wet-leased a Boeing 747-400 from South African Airways (SAA). Following the EU ban, in November 2008 the entire TAAG board was replaced and a new board was appointed with the objective of turning the carrier round, and in particular getting it removed from the EU blacklist. At the time, according to the Transport Minister, Augusto da Silva Tomás, in 14 months the company lost about US$70 million (€55.6 million). The turn-round plan included staff reductions – before the action was taken, there were about 5,000 staff. During 2008, TAAG launched a new route to Beijing. D2-TEE was one of the three Boeing 777s that TAAG Angola Airlines was allowed to use to relaunch operations to Europe following the partial lift of the EU ban on the airline in July 2009. The aircraft is seen here at Lisbon Portela Airport in May 2007. It was announced in May 2009 that TAAG had passed IATA inspections. In July 2009 (2009-07), TAAG received permission to operate flights to Europe under restricted conditions, as it was allowed to fly only into Portugal and using only its three Boeing 777s. This partial lift of the ban made TAAG the only Angolan airline that was permitted to operate into the EU. After nearly two years of being banned from EU airspace, TAAG deployed its own aircraft on the European corridor immediately. TAAG then returned the Boeing 747–400 to South African Airways.[when?] In November 2009, the European Commission extended the permission to TAAG's four Boeing 737-700s. Also in November 2009, TAAG restarted services to Havana; many Cuban doctors and teachers reside in Angola and the flight exists to help transport them. In late March 2010, restrictions over TAAG operations were relaxed again following the announcement the airline could fly its Boeing 777-200ERs and 737-700s to all European airports. In December 2010, two engine incidents involving TAAG's Boeing 777-200ERs forced the carrier to ground the three aircraft of the type. In April 2012 (2012-04), the ban was partially lifted, but some aircraft were still prevented to fly the European Air Space. An updated version of the list of airlines banned in the EU released in early December 2012 (2012-12) still included part of TAAG's fleet; however, five Boeing 777s and four Boeing 737-700s were allowed to operate into the EU; there were little or no changes in the list regarding the aircraft the airline was allowed to fly into the EU, following the release of the 11 latest versions of the list in July 2013 (2013-07), December 2013 (2013-12), April 2014 (2014-04), December 2014 (2014-12),, June 2015 (2015-06), December 2015 (2015-12), June 2016 (2016-06), December 2016 (2016-12), May 2017 (2017-05), November 2017 (2017-11), and June 2018 (2018-06). In late September 2014 (2014-09), a ten-year management concession agreement between Emirates and the Government of Angola was signed; the deal also covered flight codesharing and the coordination of frequent flier programmes. In the first full year of operation under the agreement, annual losses were cut from $175m to $5m; the Ernst & Young-audited figures for January to December 2016 were approved at the airline’s Board meeting on 9 March 2017. The contract was unilaterally terminated by Emirates in 2017 after the Emirati carrier found difficulties in expatriating around US$340 million in revenues from Angola. Originally set up within a government department, TAAG Angola Airlines remains 100% owned by the government of Angola. TAAG is itself the sole owner of Angola Air Charter, also based in Luanda, that operates cargo charters in Africa. As of July 2017[update], Joaquim Teixeira da Cunha holds the chairman and chief executive officer position. Vipula Gunatilleka holds the chief financial officer position, as of August 2017[update]. TAAG has its corporate headquarters in Luanda, Angola. The airline also has offices in Africa, Asia, Europe, and North and South America, and opened an office in Chaoyang District, Beijing, in 2010. As of October 2014[update], TAAG Angola Airlines serves 31 destinations, including 13 domestic, 11 in Africa, three in Latin America, two in Schengen Europe, and three in the Middle East and the Asia-Pacific region. Boeing 737-700QC 1 — ? TAAG Angola Airlines became OnAir's first Sub-Saharan customer. The carrier plans to offer inflight connectivity on board the Boeing 777-300ER fleet starting May 2014 (2014-05). First Class, branded as Diamond First Class, is available only on TAAG's Boeing 777 aircraft. First class features fully flat-bed seats with AVOD in-flight entertainment. Additionally, amenity kits, pillows, and blankets are given to first class passengers. Passengers also have designated check-in desks and have access to TAAG's Welwitchia Lounge in Luanda Airport. Business Class, known as Executiva Class, is found on all TAAG aircraft. On the Boeing 777 fleet, the seats are angled lie-flat with AVOD in-flight entertainment in each seat. Amenity kits, pillows, and blankets are given to all Business Class passengers. Additionally, they are entitled to priority check-in and also have access to TAAG's Welwitchia Lounge in Luanda Airport. Branded as HighFly Economic Class, TAAG's long-haul economy class cabin is equipped with AVOD in-flight entertainment. The seats feature footrests and winged headrests for extra comfort. Pillows and blankets are given to all economy class passengers, and hot meals are served on all international flights. All TAAG long-haul aircraft are equipped with AVOD entertainment throughout all cabins. Known as Palanca, there are two variations throughout the Boeing 777 fleet. Rockwell Collins' dTES system is installed on the B777-200ERs, while the newer B777-300ERs possess the Thales TopSeries™ Audio Video On-demand System. The B737-700 fleet features drop-down LCD screens, used to show cabin-wide movies and a moving map display. Additionally, TAAG has an in-flight magazine and an in-flight entertainment guide, both known as austral. 29 November 1982: An Antonov 26, registration D2-TAB, that operated a non-scheduled passenger service, flew into mountainous terrain and crashed. All 15 occupants of the aircraft perished in the accident. 28 June 2007: a Boeing 737–200 crashed in northern Angola. Portuguese news agency Lusa said the aircraft had taken off from the Angolan capital, Luanda, and was trying to land at M'banza-Kongo in the province of Zaire, which is in northern Angola near the border with the Democratic Republic of Congo. At least five people were killed and 66 injured. Among those killed in the accident was the municipal administrator of M'banza-Kongo and a senior Roman Catholic priest from Italy. The airplane was carrying 78 passengers when it crashed at 1330 local time (12.30 GMT). The agency said control of the aircraft was lost upon landing and it crashed into a building, destroying it. The director of Aeroportos de Angola (the Angolan airport authority) told national radio the pilot had missed the runway for an unknown reason while attempting an emergency landing. According to aviation sources in Luanda, the aircraft apparently punctured two tires upon landing, causing one wing to dip and touch the runway. The aircraft then veered out of control and crashed into the building. Initial press reports indicated that the aircraft touched down about halfway along the runway while attempting to land at M'banza-Kongo. 8 June 1980: A Yakovlev Yak-40K, registration D2-TYC, was shot down by a MiG-19 near Matala, Angola. There were 19 reported fatalities. 16 May 1981: A Lockheed L-100-20 Hercules, tail number D2-EAS, that was operating a freighter service, was shot down by a missile on approach to Menongue Airport. All four occupants of the aircraft perished in the incident. 8 November 1983: A Boeing 737-2M2, registration D2-TBN, crashed immediately after takeoff from Lubango Airport bound for Quatro de Fevereiro Airport; all 130 occupants of the aircraft —of whom 126 were passengers— died. UNITA guerrillas claimed to have shot down the airliner. D2-TBD, a TAAG Angola Airlines Boeing 737-200 Advanced, was involved in a mid-air collision with another airplane over Namibia on 26 December 2002. The aircraft is seen here at Paris-Charles de Gaulle Airport in 1986. 26 December 2002: A Boeing 737-2M2, registration D2-TDB, that had departed from Windhoek Hosea Kutako International Airport bound for Luanda operating Flight 572, was involved in a mid-air collision over Namibian airspace with a Cessna 404, registration V5-WAA, that took off from Windhoek Eros Airport. The collision occurred some 28 kilometres (17 mi) north of Hosea Kutako Airport. The Boeing sustained minor damage to one of its wings, but continued its flight to Luanda; the pilot of the Cessna —the only occupant of the light aircraft— managed to land it safely despite the damage it sustained in the incident. All occupants from both aircraft survived unharmed. 15 May 1979: A Lockheed L-100-20 Hercules, registration D2-FAF, crashed on landing at São Tomé International Airport. 4 November 1980: A Boeing 737-2M2C, tail number D2-TAA, that landed short of the runway at Benguela Airport, slid some 900 m following the collapse of the gear; a fire broke out on the right wing but there were no reported fatalities. The aircraft caught fire during recovery operations on November 10, and was written off. 9 February 1984: A Boeing 737-2M2, registration D2-TBV, that departed from Albano Machado Airport operating a scheduled passenger service, suffered hydraulic problems following an explosion in the rear of the aircraft and returned to the airport of departure for an emergency landing. The plane touched down fast and overran the runway. 8 January 1988: A Yakovlev Yak-40K, tail number D2-TYD, ran off the runway upon landing at Quatro de Fevereiro Airport. 8 February 1988: A Boeing 707-349C, registration D2-TOI, had its hydraulic and control lines broken after it hit an antenna on approach to Quatro de Fevereiro Airport; the nosegear collapsed when it overran the runway. 20 February 1992: A Boeing 707-349C, tail number D2-TOJ, experienced a nosegear failure during taxiing at Quatro de Fevereiro Airport. ^ a b Dron, Alan (3 August 2017). "TAAG widens net losses in 1H as fuel subsidy drops". Air Transport World. Archived from the original on 4 August 2017. ^ "Angolan airline gives up flights to Dubai | MACAU DAILY TIMES 澳門每日時報". macaudailytimes.com.mo. Retrieved 5 July 2017. ^ a b c "Emirates Airline makes rare partnership move with TAAG in Angola's small but lucrative market". CAPA Centre for Aviation. 6 October 2014. Archived from the original on 6 October 2014. ^ "Current Airline Members". International Air Transport Association. ^ "Current Member". African Airlines Association. ^ a b c d e Guttery (1998), p. 20. ^ a b "TAAG History". TAAG Angola Airlines. Archived from the original on 29 August 2012. Retrieved 29 August 2012. ^ "World Airline Survey – Direccao do Exploracao dos Transportes Aereos (DTA – Angola Airlines)". Flight International. 95 (3135): 570. 10 April 1969. Archived from the original on 29 August 2013. ^ "Civil aviation..." Flight. LX (2226): 406. 21 September 1951. Archived from the original on 29 August 2013. The latest airline to become an active member of I.A.T.A. is Divisao de Exploraçao dos Transportes Aereos, which operates out of Luanda, Angola, in Portuguese West Africa. ^ "World Airline Directory...—Divisao dos Transportes Aéreos – DTA". Flight. 73 (2569): 536. 18 April 1958. Archived from the original on 29 August 2013. ^ "Airlines of the World commerce – Direcçao de Transportes Aéreos (DTA)". Flight. 77 (2665): 498. 8 April 1960. Archived from the original on 29 August 2013. ^ "Air commerce – Friendships for EAAC and DTA". Flight. 80 (2739): 362. 7 September 1961. Archived from the original on 29 August 2013. ^ Guttery (1998), p. 21. ^ a b "World Airline Directory – Transportes Aereos de Angola SARL (TAAG)". Flight International. 108 (3445): 507. 20 March 1975. Archived from the original on 30 August 2013. ^ a b c d e f g Guttery (1998), p. 22. ^ "Air transport". Flight International. 109 (3487): 54. 10 January 1976. Archived from the original on 2 September 2013. Delivery of two Boeing 737-200Cs to TAAG of Angola, due this month and next, has been blocked by the US State Department "until such time as it is clear that there is a national government in Angola"
^ "Air transport". Flight International. 109 (3502): 1056. 24 April 1976. Archived from the original on 2 September 2013. Angola Airlines is the new trading name of TAAG. Two Advanced 737-200Cs have now been delivered, having been embargoed by the State Department during the recent hostilities. ^ "World news – Public-transport accidents". Flight International. 109 (3493): 396. 21 February 1976. Archived from the original on 2 September 2013. A Fairchild FH.227 on delivery from Allegheny Airlines to South-West African airline Suidwes was intercepted over Angola on February 11 and forced to land at Luanda. ^ a b "Airliner market". Flight International. 110 (3517): 309. 7 August 1976. Archived from the original on 2 September 2013. The Fairchild-Hiller FH-227B registered in the UK as G-BEAI was impounded by Angola while being delivered to South Africa during the recent conflict and is now in service with Angola Airlines. The Airclaims insurance group is understood to have paid a claim on the loss; the filing of a UK registration may represent an attempt to recover the aircraft. Two ex-THY Turkish Airlines F.27s and an ex-Argentine Air Force Caravelle are also being used by Angola Airlines. ^ a b "World airline directory – TAAG-Angola Airlines". Flight International. 118 (3716): 359. 26 July 1980. ISSN 0015-3710. Archived from the original on 2 September 2013. ^ "News scan". Flight International. 133 (4112): 5. 7 May 1988. ISSN 0015-3710. Archived from the original on 11 July 2014. TAAG-Angola Airlines has taken delivery of its first of two Ilyushin Il-62Ms from Aviaexport. ^ "Casualties". Flight International. 134 (4129): 38. 3 September 1988. ISSN 0015-3710. Archived from the original on 11 July 2014. A Boeing 707 cargo aircraft owned by Angolan airline TAAG crashed 20 km from the Murtala Muhammed International Airport, Lagos, Nigeria, on July 21, killing all six members of the crew. The aircraft, which was on route from Ostend, Belgium, to Luanda, crashed on approach to the Nigerian capital for a refuelling stop. ^ "TAAG's first 747". Flightglobal.com. Flight International. 29 January 1997. Archived from the original on 29 August 2012. Retrieved 29 August 2012. ^ "Orders flying in for commercial airlines". Boeing Frontiers. 4 (4). Boeing. August 2005. Archived from the original on 7 July 2014. ^ "Boeing prepares TAAG 777". Flightglobal. Flight International. 5 September 2006. Archived from the original on 29 August 2012. TAAG will use the aircraft to replace its five 737-200s and two 747-300s. ^ "Boeing delivers five aircraft in one day to TAAG Angola Airlines". London: Flightglobal. 14 November 2006. Archived from the original on 29 August 2012. ^ "Boeing Delivers Five New Jetliners to TAAG Angola Airlines" (Press release). Boeing. 13 November 2006. Archived from the original on 14 April 2013. ^ "Boeing Delivers Five Commercial Jets to TAAG Angola Airlines" (Press release). Boeing. 13 November 2006. Archived from the original on 14 April 2013. ^ "TAAG retires the Jumbo" (Press release). TAAG Angola Airlines. 7 March 2011. Archived from the original on 14 April 2013. ^ "Aircraft & Engines". Air Transport World. 28 June 2011. Archived from the original on 17 September 2012. TAAG Angola Airlines took delivery of its first Boeing 777-300ER. The aircraft is part of an order for two placed in October 2009. ^ "Boeing Delivers First 777-300ER to TAAG" (Press release). Boeing. 14 June 2011. Archived from the original on 14 April 2013. ^ Molnar, Matt (14 June 2011). "TAAG Angola Receives First Boeing 777-300ER". NYCAviation. Archived from the original on 3 June 2016. Angola’s flag carrier ordered the aircraft in October 2009. According to Boeing, it is the first 777-300ER to be purchased, owned and operated by an African carrier. ^ "Boeing, TAAG announce order for three 777-300ERs" (Press release). Boeing. 2 April 2012. Archived from the original on 14 April 2013. ^ Blachly, Linda (2 April 2012). "TAAG finalizes order for three 777s". Air Transport World. Archived from the original on 11 June 2016. ^ Ostrower, Jon (2 April 2012). "TAAG Angola to add up to six more 777-300ER". Washington DC: Flightglobal. Archived from the original on 23 July 2013. ^ "List of airlines banned within the EU" (PDF). European Commission. 12 October 2006. Archived from the original (PDF) on 26 February 2007. ^ "List of airlines banned within the EU" (PDF). European Commission. 5 March 2007. Archived from the original (PDF) on 21 April 2007. ^ "List of airlines banned within the EU" (PDF). European Commission. 4 July 2007. Archived from the original (PDF) on 9 August 2007. ^ "List of airlines banned within the EU" (PDF). European Commission. 11 September 2007. Archived from the original (PDF) on 27 November 2007. ^ "List of airlines banned within the EU" (PDF). European Commission. 28 November 2007. Archived from the original (PDF) on 30 January 2008. "List of airlines banned within the EU" (PDF). European Commission. 11 April 2008. Archived from the original (PDF) on 28 May 2008. "Blacklist of banned airlines: the European Commission adopts new measures" (Press release). Brussels: European Commission. 11 April 2008. ^ "List of airlines banned within the EU" (PDF). European Commission. 24 July 2008. Archived from the original (PDF) on 12 November 2008. ^ "List of airlines banned within the EU" (PDF). European Commission. 14 November 2008. Archived from the original (PDF) on 25 March 2009. "List of air carriers of which all operations are subject to a ban within the community" (PDF). European Commission. 14 July 2009. Archived from the original (PDF) on 6 August 2009. "Commission updates the list of airlines banned from European airspace" (Press release). Brussels: European Commission. 14 July 2009. Archived from the original on 12 August 2017. ^ a b "List of air carriers of which all operations are subject to a ban within the community" (PDF). European Commission – Mobility & Transport. 26 November 2009. Archived from the original (PDF) on 27 December 2009. "List of air carriers of which all operations are subject to a ban within the community" (PDF). European Commission – Mobility & Transport. 30 March 2010. Archived from the original (PDF) on 30 May 2010. "Commission updates the list of airlines banned from the European airspace" (Press release). European Commission. 30 March 2010. Archived from the original on 11 September 2012. ^ "List of air carriers of which all operations are subject to a ban within the community" (PDF). European Commission – Mobility & Transport. 23 November 2010. Archived from the original (PDF) on 22 January 2011. ^ "List of air carriers of which all operations are subject to a ban within the community" (PDF). European Commission – Mobility & Transport. 20 April 2011. Archived from the original (PDF) on 2 September 2011. ^ "List of air carriers of which all operations are subject to a ban within the community" (PDF). European Commission – Mobility & Transport. 23 November 2010. Archived from the original (PDF) on 24 January 2012. "List of air carriers of which all operations are subject to a ban within the EU" (PDF). European Commission – Mobility & Transport. 3 April 2012. Archived from the original (PDF) on 17 November 2012. "The European Commission updates the European safety list of airlines subject to an operating ban" (Press release). Brussels: European Commission. 3 April 2012. Archived from the original on 12 August 2017. "List of airlines banned within the EU" (PDF). European Commission. 4 December 2012. Archived from the original (PDF) on 26 June 2013. "Aviation safety: Commission updates the European safety list of airlines" (Press release). Brussels: European Commission. 4 December 2012. Archived from the original on 12 August 2017. "List of airlines banned within the EU" (PDF). European Commission. 10 July 2013. Archived from the original (PDF) on 11 July 2013. "Aviation safety: Commission updates the European safety list of banned airlines" (PDF) (Press release). European Commission. 10 July 2013. Archived from the original (PDF) on 11 July 2013. "List of airlines banned within the EU" (PDF). European Commission. 3 December 2013. Archived from the original (PDF) on 6 December 2013. "Aviation: Commission updates the European safety list of banned airlines" (PDF) (Press release). European Commission. 5 December 2013. Archived from the original (PDF) on 6 December 2013. "List of airlines banned within the EU" (PDF). European Commission. 10 April 2014. Archived from the original (PDF) on 11 April 2014. "Aviation: Commission updates the European safety list of banned airlines" (PDF) (Press release). European Commission. 10 April 2014. Archived from the original (PDF) on 11 April 2014. "List of airlines banned within the EU" (PDF). European Commission. 11 December 2014. Archived from the original (PDF) on 21 December 2014. "Aviation: Commission updates the EU air safety list" (PDF) (Press release). European Commission. 11 December 2014. Archived from the original (PDF) on 21 December 2014. "List of airlines banned within the EU" (PDF). European Commission. 25 June 2015. Archived from the original (PDF) on 15 November 2015. "Aviation: Commission updates the EU air safety list" (Press release). Brussels: European Commission. 25 June 2015. Archived from the original on 23 August 2018. "List of airlines banned within the EU" (PDF). European Commission. 10 December 2015. Archived from the original (PDF) on 24 May 2016. "Commission updates the EU air safety list" (Press release). Brussels: European Commission. 10 December 2015. Archived from the original on 23 June 2016. "List of airlines banned within the EU" (PDF). European Commission. 16 June 2016. Archived from the original (PDF) on 23 June 2016. "Commission updates EU air safety list –Iran and Africa make progress" (Press release). Brussels: European Commission. 16 June 2016. Archived from the original on 23 June 2016. "List of airlines banned within the EU" (PDF). European Commission. 8 December 2016. Archived from the original (PDF) on 25 February 2017. "Aviation Safety: Commission removes all Kazakh airlines from EU Air Safety List" (Press release). Brussels: European Commission. 8 December 2016. Archived from the original on 25 February 2017. "List of airlines banned within the EU" (PDF). European Commission. 16 May 2017. Archived from the original (PDF) on 17 May 2017. "Aviation Safety: Commission clears all airlines from Benin and Mozambique from EU Air Safety List" (Press release). Brussels: European Commission. 16 May 2017. Archived from the original on 17 May 2017. "List of airlines banned within the EU" (PDF). European Commission. 30 November 2017. Archived from the original (PDF) on 20 May 2018. "Aviation: Commission updates the EU Air Safety List to ensure highest level of protection for passengers" (Press release). Brussels: European Commission. 30 November 2017. Archived from the original on 23 August 2018. "List of airlines banned within the EU" (PDF). European Commission. 14 June 2018. Archived from the original (PDF) on 23 August 2018. "Aviation Safety: Commission removes all airlines from Indonesia from EU Air Safety List" (Press release). Brussels: European Commission. 14 June 2018. Archived from the original on 17 September 2018. ^ a b Buyck, Cathy (6 July 2007). "EC unveils blacklist as Indonesia, Angola consider reprisals". Air Transport World. Archived from the original on 3 June 2012. ^ Kamisnki-Morrow, David (28 June 2007). "All Indonesian carriers and TAAG Angola blacklisted by EU". Flightglobal. Archived from the original on 24 July 2012. ^ Latham, Brian (31 December 2008). "Angolan Airline Losing $5 Million a Month on EU Ban, Angop Says". Bloomberg L.P. Archived from the original on 23 July 2013. ^ Sobie, Brendan (30 October 2008). "SAA reintroduces 747-400s". Washington, D.C.: Flightglobal.com. Air Transport Intelligence news. Archived from the original on 11 September 2012. SAA earlier this year decided to wet-lease one of these aircraft to TAAG Angola Airlines, which needed an aircraft for its daily Luanda-Lisbon service because an EU ban precludes it from using its own aircraft. ^ Karp, Aaron (26 May 2008). "SAA: Restructuring plan on track but fuel prices a concern". Air Transport World. Archived from the original on 17 September 2012. Three 747s have been returned to lessors, one has been wet-leased to TAAG Angola Airlines and the remaining two "are in the process of being subleased through their owners." ^ "Angolan Airlines starts Luanda/Beijing second direct flight". ANGOP. 30 September 2013. Archived from the original on 11 July 2014. ^ "TAAG passes IATA's test". Luanda: ANGOP. 29 May 2009. Archived from the original on 12 August 2017. ^ "EU 'blacklist' updated; Yemenia not included, four Indonesian airlines removed". Air Transport World. 15 July 2009. Archived from the original on 17 September 2012. ^ "EU lifts Indonesian airline ban". BBC News. 14 July 2009. Archived from the original on 11 September 2012. Retrieved 11 September 2012. The statement also said TAAG Angola Airlines could now operate again into Portugal "only with certain aircraft and under very strict conditions". ^ "Aviões da TAAG voltam a Lisboa dois anos depois" [TAAG aircraft return to Lisbon after two years] (in Portuguese). Angola Press News Agency. 1 August 2009. Archived from the original on 13 August 2017. ^ Kaminski-Morrow, David (27 November 2009). "Yemenia and EgyptAir avoid EU blacklist as blanket ban widens". Flightglobal. Archived from the original on 12 August 2017. ^ "Other News - 12/01/2009". Air Transport World. 2 December 2009. Archived from the original on 17 September 2012. ^ "Angola's TAAG opens flights to Havana, Cape Town". The Independent. 10 November 2009. Archived from the original on 12 November 2012. Retrieved 10 November 2012. ^ "New EU blacklist features Iran Air, Philippine carriers". Air Transport World. 31 March 2010. Archived from the original on 17 September 2012. ^ Hofmann, Kurt (6 January 2011). "TAAG Angola Airlines grounds 777-200 fleet after engine incidents". Air Transport World. Archived from the original on 17 September 2012. Retrieved 17 September 2012. ^ "TAAG works to resolve GE90 issues on 777s". Flightglobal. Flight International. 5 January 2011. Archived from the original on 13 August 2017. ^ "List of air carriers of which all operations are subject to a ban within the EU" (PDF). European Commission – Mobility & Transport. 3 April 2012. Archived from the original (PDF) on 21 April 2012. Retrieved 21 April 2012. ^ "List of airlines banned within the EU" (PDF). European Commission. 4 December 2012. Archived from the original (PDF) on 5 December 2012. Retrieved 5 December 2012. ^ McGinley, Shane (30 September 2014). "Dubai's Emirates inks deal to manage African carrier". arabianbusiness.com. Archived from the original on 1 October 2014. ^ Kamel Yousef, Deena (30 September 2014). "Emirates Boosts African Growth in Accord With Angolan Airline". Bloomberg L.P. Archived from the original on 1 October 2014. ^ a b "TAAG Angola Airlines sees improved financial results under Emirates management team". Arabian Aerospace. 10 March 2017. Archived from the original on 11 March 2017. ^ a b Dron, Alan (31 July 2017). "Former TAAG Angola leader returns to role following Emirates pull-out". Air Transport World. Archived from the original on 31 July 2017. ^ a b Moores, Victoria (10 July 2017). "Emirates ends TAAG Angola management contract". Air Transport World. Archived from the original on 10 July 2017. ^ "TAAG Angola Airlines". AFRAA list of Current Members. 17 March 2016. ^ "Angolan airline TAAG eyes flights to EU in June". eTurboNews. Reuters. 4 March 2009. Archived from the original on 3 June 2016. ^ a b c "TAAG's operating revenue up $120m in 2012 but lack of fiscal control remains a grave worry". African Aviation Tribune. Expansão. 15 January 2013. Archived from the original on 25 May 2014. ^ "Report of the Secretary General to the 42nd Annual General Assembly - AFRAA". African Airlines Association. 2009. ^ ". "Profile for: TAAG Angola Airlines". AeroTransport Data Bank. 9 January 2012. Retrieved 9 January 2012." ^ "TAAG Angola Airlines: Angola's take-off". Business Excellence. 1 August 2012. ^ "Annual Report 2013". African Airlines Association. 2013. ^ "Annual Report 2014". African Airlines Association. 2014. ^ "Air transportation public company envisages USD 100 million/year profit as of 2019". Agência Angola Press (Angola Press Agency). 4 September 2015. ^ "TAAG Angola Airlines partners with Emirates to expand despite difficult market conditions: VIDEO". CAPA Centre for Aviation. 23 July 2016. Archived from the original on 23 July 2016. ^ "2016 Annual Report". African Airlines Association. 2016. ^ "2017 Annual Report". African Airlines Association. 2017. ^ "TAAG Offices Archived 29 January 2010 at the Wayback Machine." TAAG Angola Airlines. Retrieved on 14 October 2011. "Angola – Luanda Agência Sede Rua da Missão 123, P.O. Box 79 Luanda – República de Angola"
^ "Directory: World Airlines." Flight International. 30 March-5 April 2004. 77. "Rua da Missao 123, PO Box 79, Luanda, CP 3010, Angola"
^ "TAAG Offices Archived 29 January 2010 at the Wayback Machine." TAAG Angola Airlines. Retrieved on November 11, 2012. ^ "安哥拉航空公司北京代表处正式落成" (in Chinese). Sohu.com. 3 August 2010. Archived from the original on 2 January 2013. Retrieved 2 January 2013. ^ "Profile on TAAG". CAPA. Centre for Aviation. Archived from the original on 31 October 2016. Retrieved 31 October 2016. ^ "TAAG and Royal Air Maroc sign agreement". Luanda: ANGOP. 3 December 2011. Archived from the original on 29 August 2012. Retrieved 29 August 2012. ^ "Boeing 737-700". TAAG Angola Airlines. ^ "Boeing 777-200ER". TAAG Angola Airlines. ^ "Boeing 777-300ER". TAAG Angola Airlines. ^ "Profile for: TAAG Angola Airlines". AeroTransport Data Bank. 2 January 2013. Archived from the original on 2 January 2013. Retrieved 2 December 2013. ^ a b "TAAg Angola Airlines Fleet". ch-aviation GmbH. Archived from the original on 13 August 2015. ^ Karantzavelou, Vicky (10 April 2014). "Saudia, Kuwait Airways and TAAG Angola Airlines are connected with OnAir connectivity". TravelDailyNews. Archived from the original on 10 April 2014. ^ a b c "TAAG's Official Website – TAAG: Class". TAAG Angola Airlines. Retrieved 13 August 2011. ^ "TAAG's Official Website – TAAG: In Flight Service". TAAG Angola Airlines. Retrieved 13 August 2011. ^ Accident description for D2-TAB at the Aviation Safety Network. Retrieved on 7 July 2011. ^ "Airline flight safety: 1982 reviewed – FATAL ACCIDENTS: NON-SCHEDULED PASSENGER FLIGHTS" (pdf). Flight International: 205. 22 January 1983. Retrieved 7 July 2011. ^ Accident description for D2-TFP at the Aviation Safety Network. Retrieved on 27 June 2011. ^ "Angolan plane crash 'kills five'". BBC News. 28 June 2007. Archived from the original on 11 September 2012. Retrieved 11 September 2012. ^ Cawaia, Horacio (29 June 2007). "Five killed, 66 hurt in Angolan airline crash-landing". News.com.au. Reuters. Archived from the original on 6 June 2009. ^ Moores, Victoria (28 June 2007). "TAAG Angola 737-200 crashes in northwest Angola". London: Flightglobal.com. Archived from the original on 11 September 2012. Retrieved 11 September 2012. ^ Straus, Brian (29 June 2007). "TAAG Angola 737 crashes on landing, five killed". Air Transport World. Archived from the original on 29 June 2007. ^ Incident description for D2-TYC at the Aviation Safety Network. Retrieved on 20 June 2011. ^ "Flight safety: 1980 reviewed – FATAL ACCIDENTS: SCHEDULED PASSENGER SERVICES" (pdf). Flight International: 228. 24 January 1981. Retrieved 20 June 2011. ^ Incident description for D2-EAS at the Aviation Safety Network. Retrieved on 7 July 2011. ^ Accident description for D2-TBN at the Aviation Safety Network. Retrieved on 25 June 2011. ^ "Unita shots down TAAG 737" (pdf). Flight International: 1336. 19 November 1983. Retrieved 25 June 2011. Unita guerrillas claim that they shot down the TAAG Angolan Airlines Boeing 737 which crashed immediately after take-off from Lubango, Southern Angola, with the loss of all 126 people on board. Unita opposes Angola's Government, and claims that the flight, bound for Luanda, was carrying only military personnel. The incident took place on November 8. ^ Incident description for D2-TDB at the Aviation Safety Network. Retrieved on 23 June 2011. ^ Learmount, David (7 January 2003). "737 and Cessna 404 in collision over Namibia". London: Flightglobal.com. Flight International. Archived from the original on 11 September 2012. Retrieved 11 September 2012. ^ Incident description for D2-TAA at the Aviation Safety Network. Retrieved on 25 June 2011. ^ "Safety update..." (pdf). Flight International: 2082. 6 December 1980. Retrieved 25 June 2011. A TAAG-Angolan Airlines Boeing 737 landed short of the runway at Benguela on November 5. The aircraft, D2-TAA, destroyed its landing gear and skidded 1,000m, breaking off one engine. The starboard wing was burned out and the fuselage side received fire damage. During the recovery operation on November 10 the aircraft caught fire and was totally destroyed. There were no injuries. ^ Incident description for D2-TBV at the Aviation Safety Network. Retrieved on 7 July 2011. ^ Incident description for D2-TYD at the Aviation Safety Network. Retrieved on 27 July 2011. ^ Incident description for D2-TOI at the Aviation Safety Network. Retrieved on 27 July 2011. ^ Incident description for D2-TOJ at the Aviation Safety Network. Retrieved on 8 July 2011.